I came to Paris with one mission in mind — the mother of all macaron showdowns. To preface, I’m something of a masochist and average two emotional breakdowns annually over these small confections. Whether it be a puny foot, broken meringue, runny buttercream, or a combination of the three, I find a way to meet my two breakdown quota. If I’m going to Paris, why wouldn’t I want to see the source of both my ecstasy and agony? And so I headed to the St. Germain des Prés area in arrondissement 6. 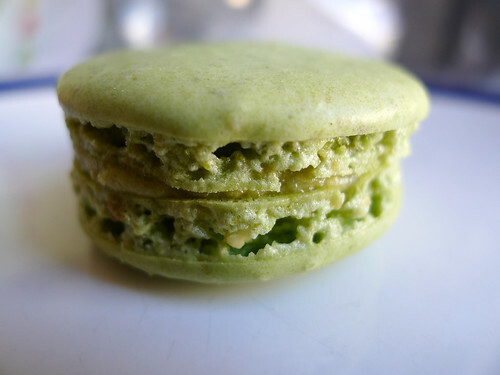 Asparagus macarons for those brave enough to try… read on! You should know, before going on this little adventure, I did some research. The macaron we know today, comprised of two delicate meringue cookies sandwiching a buttercream, ganache or jam center, was the creation of Pierre Desfontaines of Ladurée. Automatic points go to Ladurée for being the “creator” of said macarons. 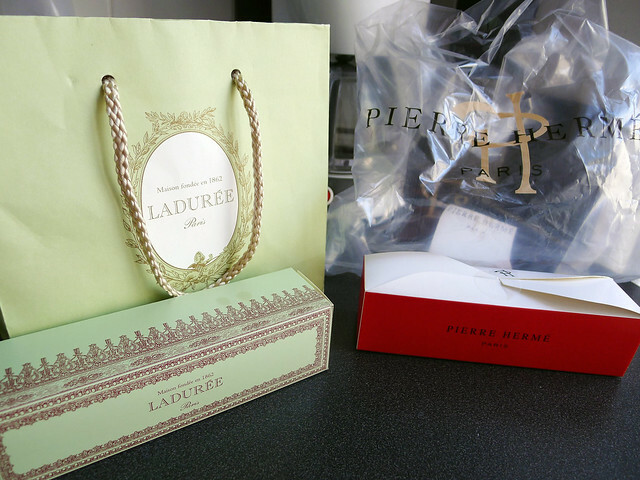 However, as luck would have it, Pierre Hermé has some history with Ladurée. Back in the late 90s, Hermé hopped on board to help expand the patisseries’ brand. So after knowing that little jewel, I thought who made it better? Did the student school the master? 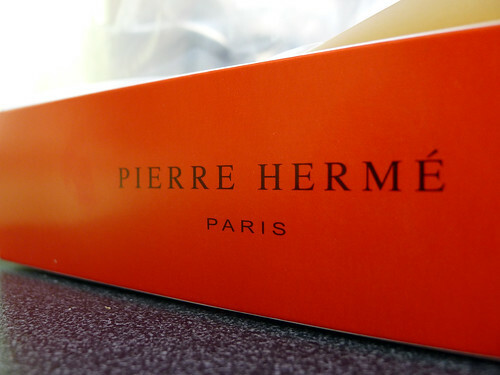 With a name like Pierre Hermé, it’s sometimes hard to think you’d need to market yourself. His St. Germain shop is simple and elegant. There are no bells and whistles. The store is dark and monochromatic and the desserts speak for themselves. Ladurée, on the other hand, understands the importance of branding. Everything, down to the mint green color scheme of their bags, boxes, and storefront is exquisite. This green has become for me synonymous with Ladurée the way Tiffany blue has for the famous jewelry shop. 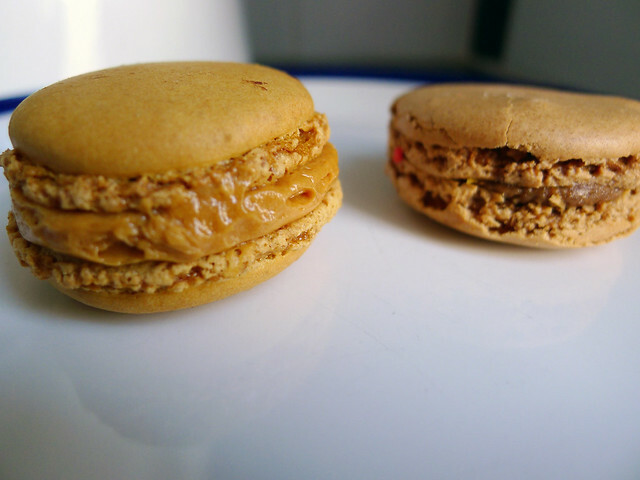 Based on visuals alone, the Hermé macarons are much thicker. The boxes were about the same length and I got 7 macarons from PH vs. 8 macarons from Ladurée. Both took a beating on my walk back to the apartment but managed to stay in tact, give or take a few cracks around the edges. 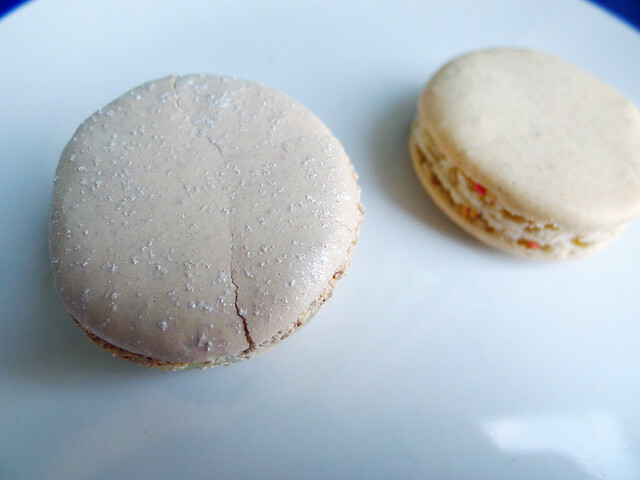 Ladurée: (shown above right) The texture of the meringue cookie was nice. There was enough chewiness to offset the very smooth filling. Both the cookie and the center had strong pistachio flavor. Pierre Hérme: (shown above left) “Very smooth” was the comment I heard the most. I thought the cookie left something to be desired. It was too soft. 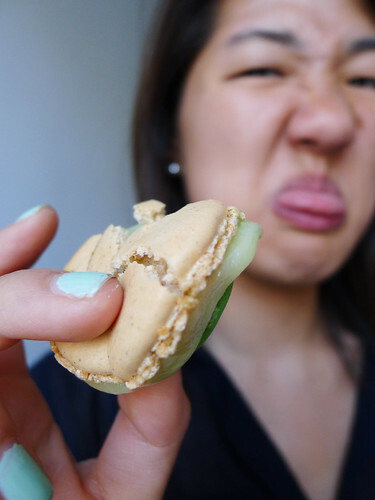 This gets into the area of personal preference, but baby food is not my idea of ideal macaron. 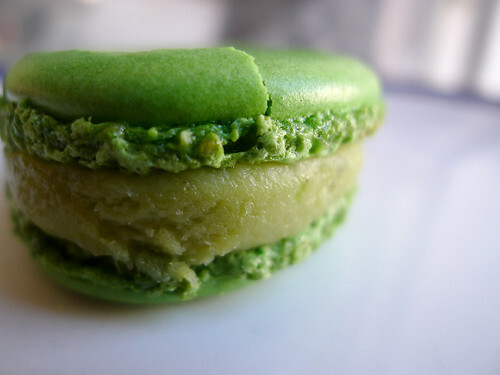 I decided the pistachio flavor was much more intense with Hermé’s macaron, but sometimes a girl needs something to chew! Ladurée: (not pictured) There was a weird mineral taste to this chocolate. It reminded me of chocolate ganache that is missing depth (i.e. some coffee). Krissie thought it had an intense burnt flavor and my parents both preferred this to PH’s. 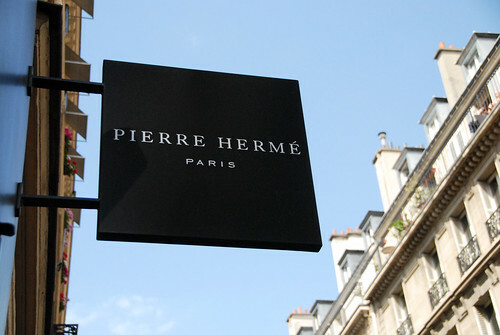 Pierre Hérme: (shown above) No contest for me. Again, this one was a bit lacking in the texture department, but there’s something about chocolate and feeling that it is literally melting in your mouth that has an edge. Sorry Ladurée, but I liked Monsieur Hérme better. This is where our flavors began to deviate. Pierre took a very sharp left, while Ladurée stayed on a more traditional course. I’ve paired them the best I could for the purpose of the showdown. 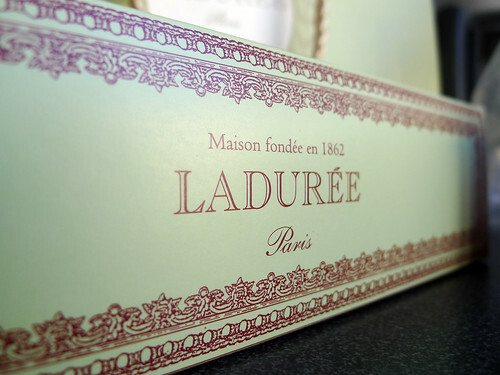 Ladurée: (shown above right) Coffee flavor to jolt any 9-5er up in the morning. Not to insult the fine bakers at Ladurée, but the flavor of the coffee and the macaron cookie (which for anyone who doesn’t know is made of almond flour) reminded me an awful lot like Jamocha Almond Fudge ice cream from Baskin Robbins. This was a childhood favorite of mine, so I’m throwing it out there as a compliment. Pierre Hérme: (shown above left) Smooth sailing on the caramel sea. Caramel with just a touch of salt. This was so yummy. I was glad they stuffed it to the brim (refer to visual). In the world of Oreos, this would have to be in the legendary triple stuffed zone. Ladurée: (shown above left) If you’re a follower of the blog, you know that I am fanatical when it comes to citrus flavored desserts. Natural raspberry (not to be confused with raspberry extract) comes in a very close second. 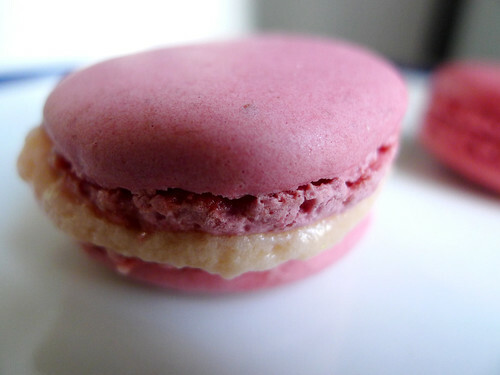 Again, the macaron had the right amount of chew to it and the jam! I could have died a fuzzy raspberry death. If I were to go back, I would be getting more than one of these. Pierre Hérme: (shown above right) Something seems very sweet and romantic about rose flavored anything. Think again. I have a fairly open minded palette and sadly roses were not the flavor of the day for me. I felt a bit like I just spritzed some perfume on my tongue. I needed a swig of milk to recover from this one. Texture was ok and the color was gorgeous, I just found out that I dislike eating flowers. Ladurée: (shown above right) This was one of the adventurous flavors I ordered from Ladurée. Believe me, this was as strange as it got. I’m talking straight laced traditional here. At the forefront, this had a very tart citrus flavor that I loved. Not a split second later, the thyme showed up and crashed the party. Thyme reminds me of chicken noodle or matzo ball soup, not delicate pastries. Let’s leave the herbs in the pantry, ok? Pierre Hérme: (shown above left) Everyone who ate this made a face. I thought it tasted like medicine. My mom straight up didn’t like it. My dad said, “interesting” and then proceeded to bite again and swallow. This was not popular, but it did garner the strongest reactions. Ladurée: (shown above right) Krissie described this one as “molten icing” and was surprised it was not a Pierre Hermé macaron based on texture alone. I agreed. 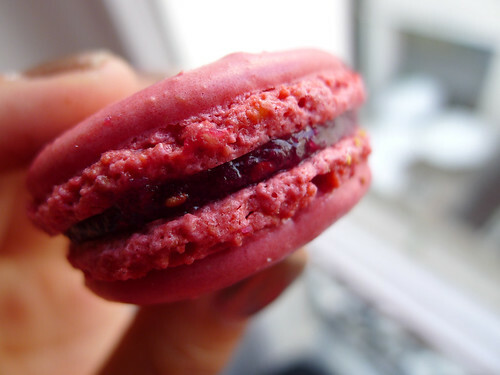 Though delicious, I found the texture too mushy and it was overly sweet the way the other PH macarons were. 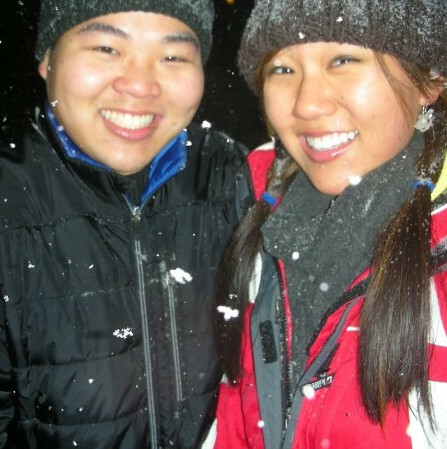 Pierre Hérme: (shown above left) Krissie immediately said she didn’t like it. It had an interesting somewhat herbacious flavor to it with a final licorice like note at the end. Parents gave it a thumbs up. Ladurée: (shown above left) The melon macaron tasted exactly like a melon candy. It had a very nice chewy texture and the marshmallow like buttercream was deceptively “light” I’m sure. I really love treats that can trick you that way, so it tugged on my heartstrings. Pierre Hérme: (shown above right) Ha! You can probably tell from Krissie’s reaction that this was not a favorite of ours. To be fair, I ordered the asparagus knowing it would be a wildcard and man, was it ever! I felt like I was chewing on a piece of sugared asparagus and I did not enjoy it. I have nothing against vegetables in desserts, just this one. Not pictured, but consumed, was the final Ladurée macaron. It was strawberry, it was too mild in flavor, and was so uninteresting to me, I didn’t even feel like posting a picture of it. FINAL JUDGMENT: Overall, I’d say Ladurée took it home for me. It wasn’t a grand slam… more like a walk with bases loaded. 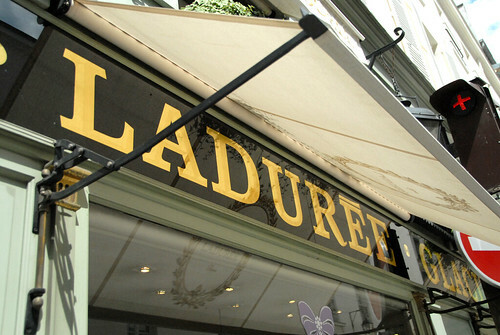 Ladurée had it’s ups and downs, but the ups were high enough to carry them. The filling variation was nice. I appreciated the jam and the “marshmallow” buttercream. Pierre got so many points for originality and presentation, but the flavors on most just didn’t grab me. Womp womp. 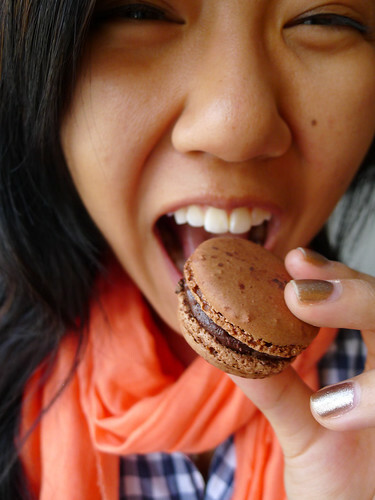 If you’re not into food blogging, don’t be surprised if you don’t know what macarons are. 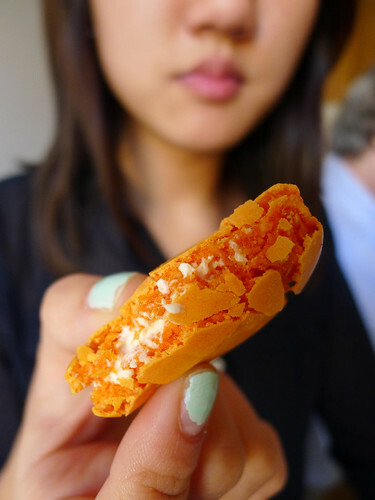 Generally I’m being told I’m mispronouncing macaroons, the Italian coconut cookies. No sweetheart, that’s not what I’m talking about. Macarons are ubiquitous in Paris. I even saw them in a French McDonalds! I wouldn’t be shocked if they start becoming more mainstream in America in the not so distant future. If they do, remember to watch out for that asparagus. 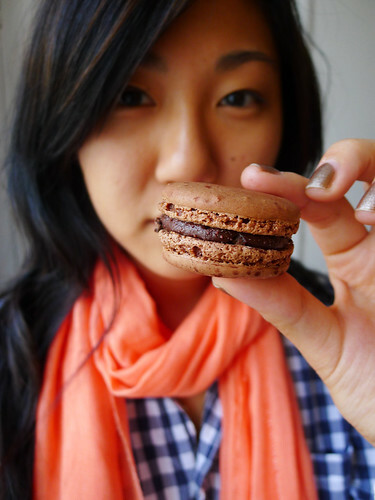 Having had Laduree macarons in London, I am eternally grateful to Vikki Cheng for the experience and can’t imagine anything better. Need to remember this when I’m going to Paris. 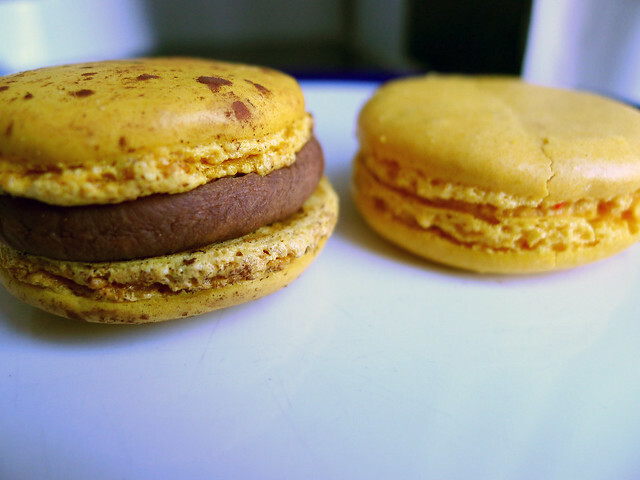 Got any tips on where to get cheap but still tasty macarons? These looks nice but expensive, are they? 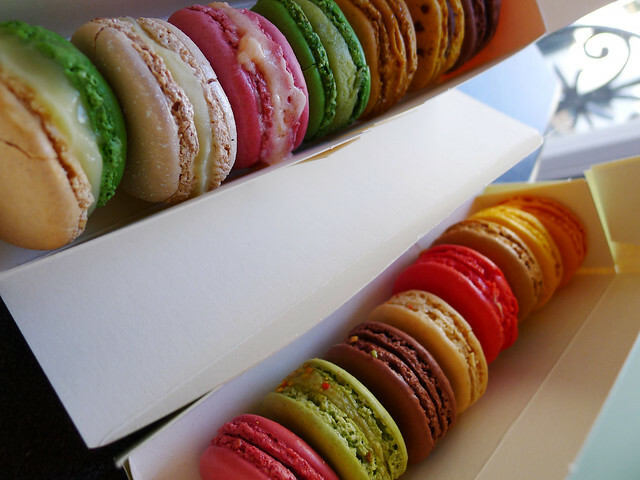 At home it is very difficult to get macarons. Only around Christmas but they are expensive and don’t taste good. Mmm I don’t know about cheap. I only went to get them at Laduree and Pierre Herme. I did see some at McDonalds, but I can’t speak to the quality. Guess I will have to google some when I go. But I will definitely try them at McDonald’s too! You never know.